Ten new videos on Youtube for your watching pleasure! Medieval Fair – Are We There Yet? From National Geographic Kids – Julian and Rosie travel back in time when they dress-up for a Medieval Fair at a castle in France. NTNU’s University Museum has one of the finest collections of medieval church art from Scandinavia. Part of the secret for why church art from this period has been preserved lies in Norway’s religious history. Margrethe Stang, an associate professor at the museum, explains. Jackson Crawford on how to say common everyday things in Old Norse (like “How are you?” or just “hello”). 10 Ancient Languages that Disappeared! Matthew Santoro, the popular Youtuber, gives us a list of ancient (and medieval) languages that are dead (but some not quite dead). What rooms are inside REAL medieval castles? Shadiversity on the type of rooms would you expect to find within a historical medieval castle? Morgan Donner offers a guide to creating a medieval man’s shirt for beginners. A hotel development in Dublin halted production last October when the remains of what appeared to be 12th century Irish structures were discovered, including an example of graffiti art carved onto a piece of slate. Dr. Julie Mell, associate professor of history at N.C. State University, discusses themes from her book “The Myth of the Medieval Jewish Moneylender.” Mell offered these comments during an interview for Carolina Journal Radio Program. 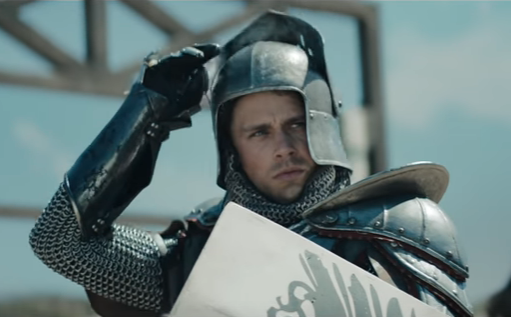 This GEICO commercial tells the story of the first heckler in recorded history appears at a jousting tournament to taunt a visiting knight.